Adult female owned and driven (occasionally) since new. Near flawless cosmetically. 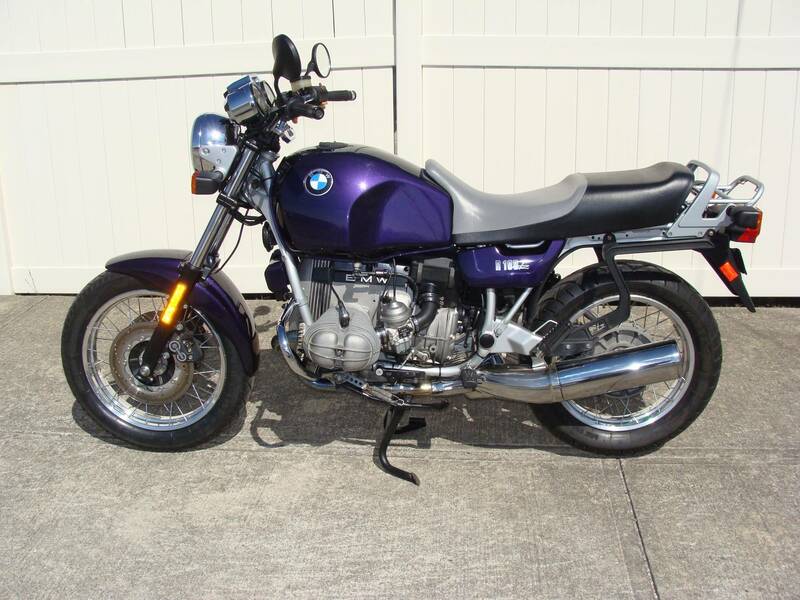 The original BMW purple paint is striking! All the chrome, and there is LOTS of it, is in VERY GOOD condition. Has Bob’s BMW Throttle cruise control. Has 2 Luftmeister, metal case with reusable sintered bronze filter, fuel filters. 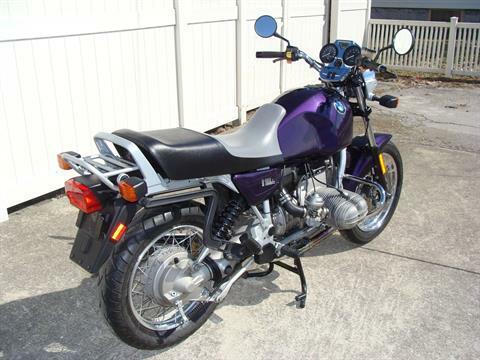 The engine is cooled by an original BMW oil cooler with a paint matching cover. The front brake was just converted to Dual Disc. 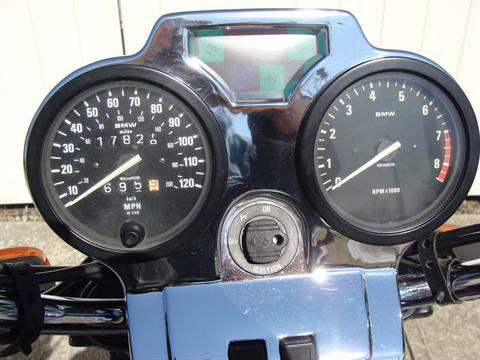 A like new 2nd disc was installed, and an original matching caliper was rebuilt, and a new larger master cylinder was installed to handle the increased volume necessary. A Speigler braided stainless steel one piece brake line was installed. The old caliper on the other disc was also rebuilt. Both calipers got new EBC brake pads. A complete end-to-end Major BMW Factory Recommended Service (10K) has just been performed. The carburetors were both rebuilt. The motor top end, and bottom end, including oil pan, was just resealed. The clutch was cleaned and inspected as VERY Good. The Conrod bearings were inspected, and the conrod journals were measured, and are at minimum clearance specifications. The forks were removed, and the steering neck bearings were cleaned and inspected and re-greased. The forks were disassembled, cleaned, and inspected. They were then re-assembled and refilled with the proper type and weight oil. The transmission was opened up and inspected. All was found as VERY GOOD. While it was open, the shifter rollers were upgraded from nylon to the more recent style metal rollers. Also, all the transmission seals were replaced. A new clutch throw-out boot was also installed. New pressure valves were installed in both wheels. A new shift lever rubber was installed. The battery is sealed and is in good condition. A new rubber battery hold-down strap was installed. The commonly found leaking o’ring on the rear brake pivot was replaced. The rear shoes and drum were cleaned and inspected and found to be in very good condition. 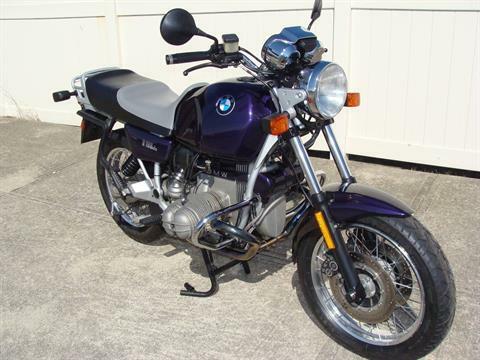 All work was performed by a fully trained former Re-Psycle Technician with 10 years BMW cycle experience, and all current work was done under the direct supervision of our current Lead Technician. The exhaust is in near perfect condition. The Metzeller tires have several years on them. They have significant tread left and are safe to ride, but we would recommend they be replaced before any extended Summer highway riding. The bike has a full original BMW tool kit, a n Owner Manual, and a Service annual. A pair of BMW chrome engine guards are installed. A pair of BMW Factory Integral saddlebag mounts are installed. There are a pair of Integral saddlebags that will be included with the bike (photos soon). They were used on this bike as well as another BMW, so there is additional wear on them; but they are still in good useable condition. There is a Bagster tank bag available; photos on request. The left fuel tank BMW Rondell badge has paint peeled off; it has been ordered and will be installed as soon as it arrives.